Spotify is a digital music service that gives users access to millions of songs. It is the undisputed king of streaming music with 20 million paid users and 55 million free listeners. Now Apple has entered the fray, recently announcing its much anticipated new music service, Apple Music. 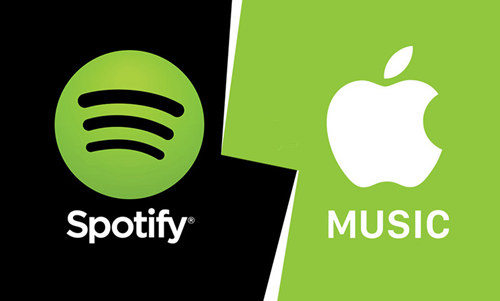 Now many users are trying to figure out how to transfer playlists from Spotify to Apple Music. Unfortunately, there’s no easy solution for this dilemma, but don’t worry. In this guide, we’ll introduce two reliable third-party tools that work well to transfer music and playlists from Spotify to iTunes library. STAMP is a simple-to-use application that helps to transfer music/playlists from Spotify, Rdio and CSV file to iTunes and Apple Music. Before you begin, make sure you are logged into iTunes with your Apple ID and subscribed to Apple Music. Also, export your Spotify playlists as .csv file using Exportify. 1. Go to the STAMP website and download the app. 2. Open iTunes and head to either the “For You” or the “New” tab. 3. Open STAMP and select the .csv file you want to import. 4. Click parse and wait for the application to finish importing. 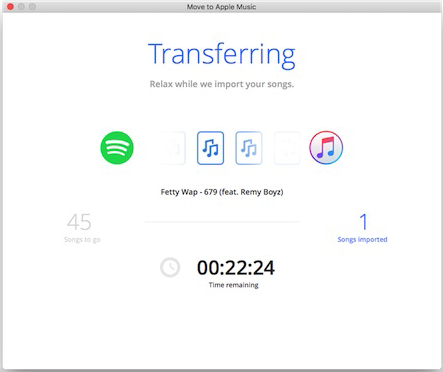 Move to Apple Music also provides a very simple and easy way to transfer music and playlists from Spotify and Rdio to Apple Music. Head over to the Move to Apple Music website and get the app. Download, install the app and select “Spotify” where you playlists are located. Log into your Spotify account and allow Move to Apple Music access to the app. 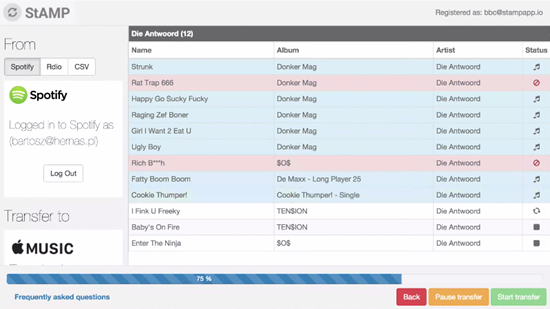 A list of playlists fetched from your account will be displayed. Choose the playlists that you’d like to move to Apple Music and hit “Next”. After that, the app will start to check your tracks and transfer music from Spotify to iTunes. After the transfer has been completed, click the “Save My Playlist Files” button and choose the location where you’d like the file to be saved on your Mac. Now go back to iTunes and click “File” > “Library” > “Import Playlist” and choose the saved file. The playlists will now be imported into iTunes and Apple Music.